The totality of this mural is at Dartmouth University where José Clemente Orozco spent some time. On the grounds that you keep popping up ni similar places to me I thought I'd pop over here. This does not worry me, Four Dinners. Perhaps it should, but it does not. Of the big three, José Clemente Orozco, David Alfaro Siqueiros, and Diego María de la Concepción Juan Nepomuceno Estanislao de la Rivera y Barrientos Acosta y Rodríguez, better known as Diego Rivera, it is by far the most difficult to locate samples of Orozco's work on line that are suitable for ripping and posting here. The second painting really grabs. I love the repeating gun barrels in lower right corner mirroring the pillars in the upper left frame. The colours are very effective and this painting completely leaves the other one in the dust. The way the bullet holster on the man gentleman come to an apex mirrors the building corners behind him. 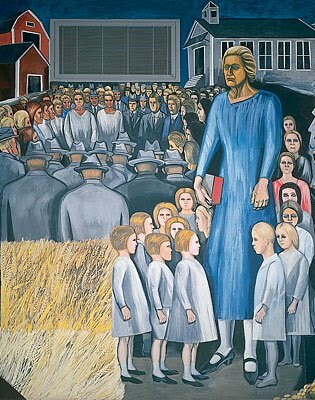 Of course, I appreciate the link between the farm building and the school in the other painting. Teachers and school in league with the oppression of the agricultural economy. There are some good teachers in the world...but this painting reminds one of the tyranny of so many people attracted to the position of "teaching" others and playing the "experts". I'm not sure which painting is more scary! 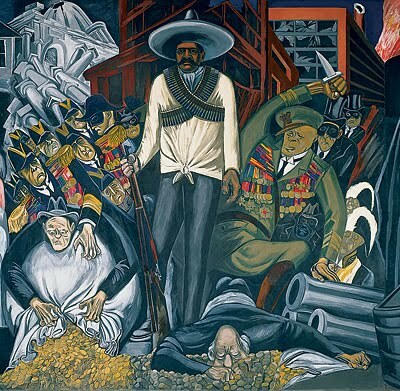 Unlike the work of the other two, Candy, for me Orozco's murals have a bit more of the political cartoon style about them. Not displeasing by any means. It is simply quite different. When I use a phrase like "political cartoon style," it is like using the word "primitive" when talking about a painting style. There is the risk of conveying a pejorative sense when that is not intended. Painting--oh, hell, all art--is difficult to speak about.